Sooner fans, "Stripe the Stadium" and coordinate the display of our colors in front of a primetime, nationally-televised audience Saturday night as No. 14 Oklahoma faces No. 3 Ohio State. If you're sitting in an odd-numbered section, wear white. 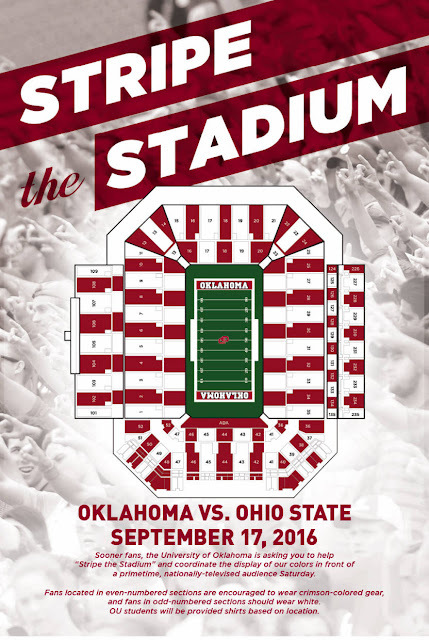 If you're sitting in an even-numbered section, wear crimson. OU students will be provided shirts based on location. Get to your seats early as a 360° Gigapixel panoramic photo will be taken prior to starting lineups (approximately 6:20 p.m.). Let's show the nation There's Only One Oklahoma and surround the Sooners with sound Saturday night! Oklahoma has previously Striped the Stadium on four different occasions (Notre Dame 2012, Tennessee 2014 and West Virginia 2013 and 2015).